Disclaimer: Do not attempt these stunts at home. 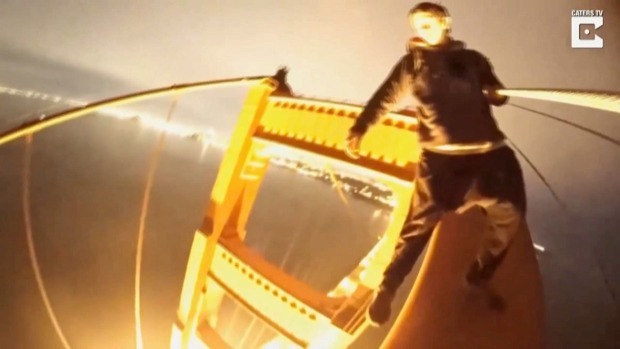 Two audacious daredevils recently risked it all under the cover of darkness to scale all 500 feet of one of the Golden Gate Bridge's towers. But their adventurous climb caught on camera wasn't designed to simply capture a picturesque view. They wanted their stomach-churning video to drive traffic to their YouTube channel. The duo dangled off the tower's ledge with only their fingertips latched onto the thin railing, pulled off a couple somersaults and even snapped a selfie shot while standing on top of the tower's highest point. "It was super breathtaking," 18-year-old climber Peter Teatime of Wisconsin said. "One of the most incredible things I have ever seen. It's pretty miraculous up there." Teatime, who describes himself as being a "really curious person," said he has been climbing buildings all over the globe for several years. To most, ascending the Golden Gate Bridge would seem like an illegal and daunting task. To Teatime, it was just another climb on his list. "To us, it's not nerve-racking," he said. "You kind of just clear your mind and you're in the moment." The death-defying adventure was not taken lightly by the Golden Gate Bridge, Highway and Transportation District. "The Golden Gate Bridge isn’t a playground," spokesperson Priya David Clemens said in a statement. "It’s a vital Bay Area transportation artery and a symbol of our community. These climbers’ reckless actions could have caused immeasurable harm to those driving below." Teatime isn't worried about any repercussions. He said he respects those who patrol the bridge and purposely dangled late at night to avoid a potential accident with busy traffic below during the daytime hours. He also pointed out that he and his friend did not harm anyone or damage any property. If anything, Teatime welcomes a conversation with authorities. He said he's willing to point out flaws in the bridge's security system. 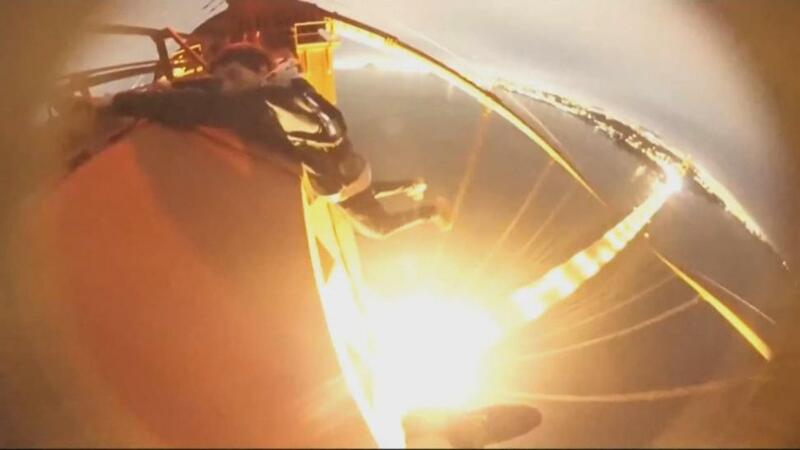 Clemens admitted that the daredevils' adventure "did not trigger any alarms, so the Golden Gate Bridge District's patrol was not aware of the activity at the time." Authorities are investigating the stunt, and the Golden Gate Bridge, Highway and Transportation District is considering legal action. Changes to security protocol at the bridge are also in the works. Climbing on the bridge is a misdemeanor under state law, according to Clemens. The last time someone conducted a similar incident was four years ago, and the individual involved lost their job and was added to the no-fly list. The California Highway Patrol says it is waiting for information from the Golden Gate Bridge to write up a report. It will then send it to the District Attorney's Office, which will decide whether or not to press any charges. The Golden Gate National Recreation Area also could consider trespassing charges, but it wasn't sure Tuesday if it would pursue it. Jail time and a fine would be possible if the pair were found guilty. Days after capping the pulse-pounding stunt with a brisk shuffle back to solid ground, Teatime summed up the experience in five words. "Craziest experience of my life," he said. NBC Bay Area's Mark Matthews and Jean Elle contributed to this report.